Jagdalpur recruitment 2018. Medical College Bastar vacancies application form submission last date is 01-08-2018. 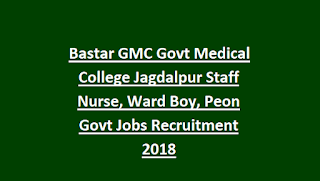 Application form is available for download at www.bastar.nic.in website for this GMC Jagdalpur vacancies. These vacancies are one year contract basis. Along with application form candidates must have attach all necessary documents and 2 self addressed covers. 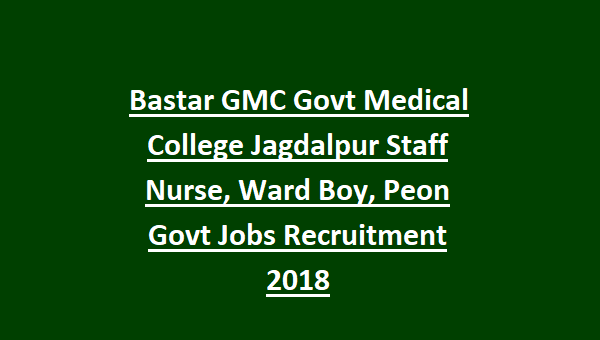 More information related to this Bastar Medical College GMC Jagdalpur Staff Nurse, Ward boy jobs selection process, age limits and other details are given below. There are total 119 posts in this recruitment of Govt Medical College of Bastar. Organization: Baliram Kashyap Memorial Govt Medical College Jagdalpur, Bastar. For Sweeper, Chowkidar and Peon posts 5th pass is required. For all the posts upper age limit is 35 years and lower age limit is 18 years. Age relaxations are applicable or reserved candidates as per CG State Govt norms. Candidates selection is based on merit in qualifying exam and documents verification. Candidates can download the application form from www.bastar.nic.in. Last date to submission of Application for to GMC Bastar is 01-08-2018. Along with application form candidates must have submit all the supporting documents and 2 self addressed covers.